We spend a good four or five days in Sedona before moving down the road. I must admit it’s a strange town, but it’s bedrock beauty is nothing to sneeze at. Breathtaking canyons and spires of rock inspire the artists and are at the same time a challenge to photograph really well as they are heavily photographer. Only the best light will do. We went to the popular airport view for Sunset one night. I’m not sure I’ve even found a crowd so large to watch a sunset. There much have been 200 people there snapping away. I however just stood around with my view camera and chatted because the sunset was a bit flat. It was pretty and all, but to make a wall print we need something breathing. The sun set and the crowds washed away. We loaded up and headed down the hill, But halfway down I look at the light of the city coming on and turned around, realizing I had just left the best behind me. I went back to the now empty viewing lot and had my pick of vantage points as the last light faded in the sky and Sedona Night came on. The key of the night is taking your time. You cannot be quick and you don’t need scores of image. You need one. Tripods are a must else you will end up cranking the ISO so high that your image will be lost (see the Six Keys). Regardless of when you make the image I find setting up before the light is gone is best. You need to be able to see into the shadows, know where errant tree limbs are and make a visualization. The area was empty now and I setup the tripod on the concrete slab to which a pay telescope was mounted. They have not been trimming back the trees and they are taking over the view. But using the pad and the center column on my tripod gave me some extra height and left the treetops as a mild flooring to the bottom of the frame. I make a few test exposures and meter, but in cityscapes you’re dealing with pins of bright light that are hard to meter individually. I get as much info as I can and then try to keep the high points of light around zone 9 just shy of clipping. The light is fading fast here and I did a few later images as well, but the small bit of light left gives interest to the sky and makes this scene come alive much more than in total darkness. Post production was pretty simple because I planned in the camera. I applied a preset for a bit of dynamic range I managed my tone values a bit and made sure my pin highlights were not too hot. Then into Photoshop for a tiny bit of burning, dodging and detail work on the sky before cropping off extra space. I’ll work the final details a bit further for print quality and to keep the shadows rich. All in all I’m quite happy with the image. 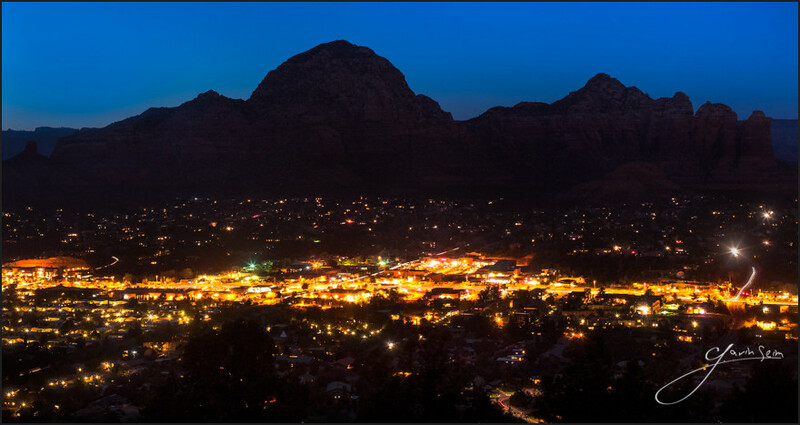 This entry was posted in art study, color, f164, Fine Art, nature, signature, technique and tagged blue, city lights, cityscape, f164, mountains, night, red rock, roads, sedona, sedona az, sunset. Bookmark the permalink.